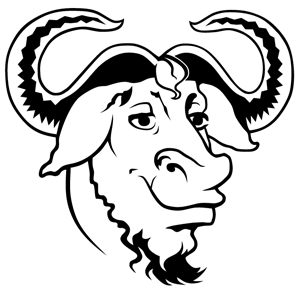 Finally, it’s time to switch to the fabulous GNU as. We’ll forget about DEBUG for some time. Thanks DEBUG. GNU as, Gas, or the GNU Assembler, is obviously the assembler used by the GNU Project. It is part of the Binutils package, and acts as the default back-end of gcc. Gas is very powerful and can target several computer architectures. Quite a program, then. As most assemblers, Gas’ input is comprised of directives (also referred to as Pseudo Ops), comments, and of course, instructions. Instructions are very dependent on the target computer architecture. Conversely, directives tend to be relatively homogeneous. Originally, this assembler only accepted the AT&T assembler syntax, even for the Intel x86 and x86-64 architectures. The AT&T syntax is different to the one included in most Intel references. There are several differences, the most memorable being that two-operand instructions have the source and destinations in the opposite order. For example, instruction mov ax, bx would be expressed in AT&T syntax as movw %bx, %ax, i.e., the rightmost operand is the destination, and the leftmost one is the source. Other distinction is that register names used as operands must be preceded by a percent (%) sign. However, since version 2.10, Gas supports Intel syntax by means of the .intel_syntax directive. But in the following we’ll be using AT&T syntax. From a general view, we identify 3 elements in the above listing. First, we have directives, which are symbols beginning with a ‘.’ (dot.) As aforesaid, directives are typically valid for any computer. If the symbol begins with a letter the statement is an assembly language instruction, i.e., it will assemble into a machine language instruction, and surely will differ between computer architectures. Finally, labels are those symbols immediately followed by a ‘:’ (colon.) We may think of labels as “directions” for data or code. Now let’s do a shallow review of a few germane directives, so bear with me. This directive identifies the start of the logical file (and string should be the file name.) Actually, the directive is ignored and is only there for compatibility with old versions. We can remove it. This pair of directives enclose debugging information for the symbol name, and are only observed when Gas is configured for PE/COFF format output. But we don’t need it for a simple hello, world! program. The gcc’s output we’ve got recurs to the form with flags, and specifically, two flags (single character) are used to indicate the attributes of the section: d (data section) and r (read-only section.) But again, we don’t need to explicitly signal section attributes for our simple program. Tells Gas to assemble the following statements onto the end of the text subsection numbered subsection. If subsection is omitted (as it’s our case), subsection number zero is used. Clearly, this directive is mandatory, or Gas will not assemble the code to print our hello, world! message. .global makes symbol visible to the linker. In our case, we want to inform the linker about the _main function that it is expecting. For compatibility with other assemblers, both spellings (.global or .globl) are valid. Now, directives are done. After label _main we only have assembly code up to the ret instruction. Some of this code should be clear if you have previous experience with assembly programming. Nevertheless, let’s review these instructions too. Note that the ‘l’ on the end of each mnemonic tells Gas that we want to use the version of the instruction that works with “long” (32-bit) operands. Remember that in hexadecimal, -16 is expressed as 0xFFFFFFF0. Therefore, this and aligns the stack with the next lowest 16-byte address. The reasons for this alignment are not very clear to me. It may be a gcc choice in order to accelerate floating point accesses, or it may be for compatibility with a particular architecture. Any of these, we don’t require such alignment for displaying hello, world! These two calls are unnecessary for our toy application. We won’t delve into details, but I’ll say the alloca() is a function used to allocate memory on the stack. And if PE/COFF binaries are used, and our application has an int main() function, then a function void __main() should be called first thing after entering main(). We’ll leave it at that for now. More information can be found in this excellent and instructive article from OSDevWiki. It moves the address of the ascii string into the stack, and invokes printf. Now, where’s the definition of printf? Well, we’ll take it from the C library, of course. The linker (ld) is responsible of associating our code with the definition of printf. These instructions constitute the “returning code.” Store the return value (0 == success!) in EAX, destroy the stack, and pop the saved Instruction Pointer from the stack in order to return control to the calling procedure or program. This entry was posted in programming and tagged Assembler, assembly, at&t, bytes, C, code, coff, Debug, directives, gas, gcc, gnu, hello world, instructions, intel, Languages, pe, programming, stack, x86. Bookmark the permalink. Both comments and trackbacks are currently closed.